North Queensland Cowboys recruit Carlin Anderson revealed it took just one word from coach Paul Green to make him believe he could be an NRL player. 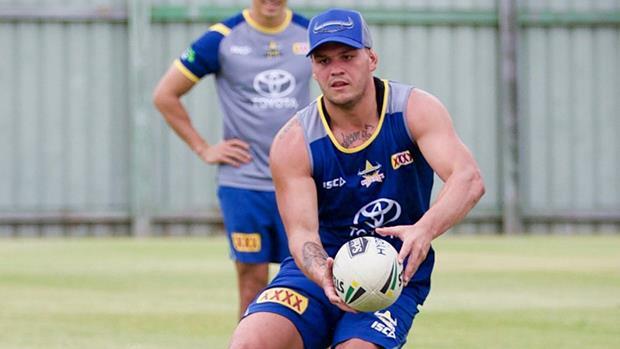 The 22-year-old fullback is coming off a stellar season with Townsville Blackhawks in the Intrust Super Cup after the Cowboys had announced he would link with the club from 2018 on a two-year deal. He has started pre-season training with the belief he can make it in the big time, as opposed to wondering if he belongs. "The thing that gave me a lot of confidence was when Greeny was asked in a press conference where he saw me as a player and he said 'fullback'," Anderson told NRL.com. "I never knew if I'd be good enough to play fullback in the NRL. "I thought he might have said wing, but coming from him that gave me a lot of belief coming into a full-time system." You need to go back to 2016 to understand how one word, innocuous as it may seem, could have such an impact. After helping guide the Ipswich Jets to the 2015 Intrust Super Cup title he signed with the Broncos, but it was a year plagued with misfortune. "I went to the Nines with the Broncos and ended up in hospital the first day after something went wrong with my stomach," he said. "Then five or six games into the season with Ipswich I broke my jaw. My very first game back against PNG, I broke the jaw again. "Wayne [Bennett] couldn't really pick me that year because he didn't really see much of me, but it sucked having to leave. "I didn't know what I wanted to do but I spoke to my manager [Clinton Schifcofske] and [Blackhawks coach] Kristian Woolf, and it felt like the right move was to come up here, give it a crack and see if I could get back into a full-time system. It paid off." With Kalyn Ponga moving to the Knights, there was a vacancy for another fullback to serve as a back-up to Lachlan Coote in Townsville. "Cootey is the No.1 fullback and an awesome player, but if an opportunity comes up next year I will take it with both hands," he said. "To play NRL for however long I have got left in the game is my driving focus. "What I am enjoying is the way everything is so professional at the Cowboys, and how easy it is to talk to the coaches and get some feedback." Anderson, a state representative cricketer as a schoolboy at Ipswich Grammar School, was regarded as a future star of that game before league became his focus. "I really liked Twenty20 and I would have loved to have had a go at it, but when I left high school I sort of fell out of love with cricket after playing it my whole life," he said. "I knew I had an opportunity there, but I went to the Ipswich Jets and my footy just took off and I haven't really looked back. "I went there as an 18-year-old kid and [Jets coaches] Ben and Shane Walker believed in me and taught me a lot." Anderson broke his arm in the latter stages of the season for the Blackhawks but said his recovery from the injury at pre-season training was well on track. "It is not back to 100 per cent and still fatigues here and here, but I have been doing weights and it is going pretty good," he said.